In the 1920s and 1930s, Garfield Wood—known as “Gar” or the “Silver Fox of Algonac”—was probably the most famous powerboat racer in the world. Growing up in Duluth, he learned many of the skills that made him both a millionaire in business and a fierce and fearless competitor on the water. Garfield Arthur Wood was born on December 4, 1880, in Mapleton, Iowa. He was named after James A. Garfield and Chester A. Arthur, America’s newly elected President and Vice President. His father was Walter W. Wood, a Civil War veteran from Ohio who worked as a grocer in Mapleton. His mother was Elizabeth (Benton) Wood, whose family had come from New York to Minnesota to run an inn along the stagecoach line between St. Paul and Duluth in the 1860s. About 1883, the Wood family moved to Osakis, Minnesota, in Todd County, where Walter found work on the railroad during the winter and in the summer operated a ferryboat on Lake Osakis. Some summers he ran a ferryboat in Duluth, leaving the family in Osakis. The Woods would eventually have twelve children, nine boys and three girls. In 1893, when Gar was twelve, he was hired to oversee the care of three power boats purchased by the government as inspection boats during construction of the Duluth harbor. He learned all he could about the workings of engines while on this job. He also accompanied his father on the Vidette and learned about that ship’s operation. Gar Wood is listed in city directories of the early 1900s as a boatman for the Duluth Boat Club and as an electrician for the Duluth Telephone Co. He left Duluth temporarily around 1903 to study engineering at the Armour Institute of Technology in Chicago, founded in 1890 with a gift of $1 million from prominent Chicago meat packer Philip Danforth Armour Sr. The school offered professional courses in engineering, architecture, chemistry, and library science. Wood returned to Duluth upon graduation from the Armour Institute and, in 1906, became involved in the fledgling automobile industry. He was one of the first Ford dealers in the area, selling the Model N (successor to the Model A), and he received the first shipment of five of the cars in Duluth. He also showed his interest in speed when in May of 1905 he was charged with carelessly and negligently operating an automobile at a high and dangerous rate of speed on London Road—and killing a dog. Wood left Duluth for St. Paul around 1908. 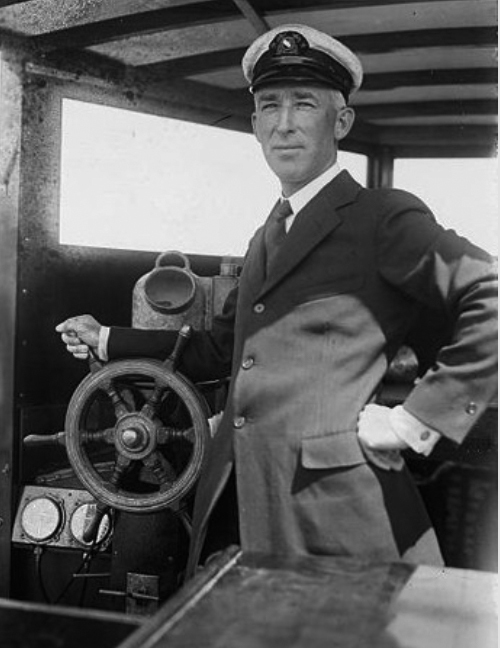 He first sold Fords for the Northwestern Automobile Company, but by 1910 he had opened G.A. Wood Co., an automobile repair and supply shop. On September 14, 1910, Wood returned to Duluth to marry Murlen M. Fellows. She was a 1904 honors graduate of Duluth Central High School and a 1908 Phi Betta Kappa graduate of the University of Minnesota. They made their home in St. Paul. Wood’s life changed in 1912 when, walking on a St. Paul street, he observed a truck driver unloading coal from a truck with a hand-operated lift. Wood got the idea of putting a hydraulic hoist under the front of the truck’s box; he built it in his shop and filed for a patent on October 21 along with Grant Waldref, manager of Waldref-Odell Motor Car Company, the Twin Cities first Pierce Arrow dealer. That year Wood opened the Wood Hydraulic Hoist Company in St. Paul, and the next year he moved the company and his family to Detroit. By 1921, Wood had three factories in Detroit, one in Canada, and an assembly plant in Paris—and he had sold more than 60,000 hoists. He expanded the business to include truck equipment and bodies, cranes, and road machinery, and he would eventually have a fortune estimated at $50 million. In 1916, Wood purchased his first powerboat, the Miss Detroit I, built by the Chris Smith and Sons Boat Company of Algonac, Michigan. Wood eventually purchased that company and built racing boats with Chris Smith for six years. From 1917 to 1921 Wood won five straight American Power Boat Association Gold Cups with the boats he built with Smith. But the partnership didn’t last. In 1923 Crhis and his sons broke off to start Chris-Craft Boats. In 1920, Wood began racing for the British International Trophy for Motorboats, nicknamed the Harmsworth Trophy, the top prize in a competition started by England in 1903. The competition was suspended from 1913 to 1920 because of the First World War. Edward Shroeder had won the tropy for the U.S. every year from 1907 to 1911, but England had won the last two Harmsworth Trophies in 1912 and 1913. Wood was determined to return the trophy to the United States. He won the 1920 race, held in Osborne Bay, England, in his boat the Miss America I and brought the competition to the Detroit River in 1921. Wood won the Harmsworth Trophy for seven of the next eight competitions—1921, 1926, 1928, 1929, 1930, 1932, and 1933—in boats ranging from Miss America I to Miss America X, losing only in 1931 when he was disqualified and his brother George won in Miss America VIII. Wood’s fastest average speed in the competition was 86.94 miles per hour in 1933. Whenever he raced, he always had with him in the boat two teddy bears, Teddy and Bruin, for good luck. Watch Gar Wood racing here. Over the years, Wood set numerous speed records on the water. Racing his boat Miss America IX in 1931, he was the first to reach 100 miles per hour, setting a top speed of 102.256 miles per hour. He was the first to put an airplane engine in a boat, which he did in 1917 in Miss Detroit III. Twice Wood raced trains with his powerboats, and both times he won. In 1921 he raced a train from Miami to New York City, completing the distance in a running-time-only record of 47 hours and 15 minutes, beating the train by 29 minutes. In 1925 he beat the Twentieth Century Limited on a trip from Albany to New York City. In the 1930s, Wood met with President Roosevelt about his design of a launch for the Navy; it was eventually manufactured as the PT boat, which General Douglas MacArthur praised. Wood also invented a pilotless powerboat that the Navy used for target practice. Wood retired from competitive racing in 1933 but continued to build boats under the names of Gar Wood Incorporated and Gar Wood Industries. While Hollywood’s attempts to make a deal with Wood for his life’s story all failed, in 1952 he hired a team to make the movie for him. Titled Time to Move, the project ran over budget and was dropped after a few months of filming. Gar and Murlen Wood had one child, Gar Wood Jr., born in Detroit on March 31, 1918. Murlen died in Hollywood, California, from heart disease on August 23, 1948, while visiting her sister. In her will, she said that her husband was wealthy and didn’t need her money but that she wanted him, her “beloved skipper,” to have her ring “which has been my lodestone through a long and happy voyage.” Gar Wood died of a stomach ailment in Florida at the age of 90 on June 19, 1971, about a week before a planned civic celebration in Detroit to honor the 50th anniversary of his first defense of the Harmsworth Trophy. Gar and Murlen are buried together in the Oaklawn Cemetery in Algonac, Michigan.